Forget about the bear…This film is Jack London on steroids. There are several heart-stopping moments in this tale of survival in its most basic form. Two of our greatest actors are working to make this a believable plot, and that is a stretch at times. The bear attack comes early in the film, and unlike “Saving Private Ryan” where the landing at Normandy is balanced with periods of relative calm, there’s little peace to be found in this unrelenting tale of survival. The harsh elements and the question of what makes a man have the will to survive when Mother Nature’s harshest elements are working against you is one of the many points that pin this plot together. It is at heart a very simplistic tale of Man vs the Elements and Man vs Man. But Tom Hardy and Leonardo DiCaprio deserve shared praise for their physical performances and nuanced shadings to at times one-dimensional characters. DiCaprio by far has the most physically difficult role playing Glass, the man who is left for dead in the wilderness after being mauled by a Mother bear protecting her cubs. Hardy has, in a way, a more difficult acting task in his portrayal of a man who, although innately evil, has some elements of humanity that mark him as more than just a cardboard caricature of the “bad guy.” In these roles, there are shadings of Stephen Crane’s questions of survival voiced in “The Open Boat”. What gives our life and our very will to survive meaning? And in some subtler way, there are underpinnings of Conrad’s anti-hero found in “Lord Jim”. What makes a man a hero? And what makes him a coward? And do we have elements of both within each of us, where time and place may combine to make either heroes or cowards of us all? But in this film, as with Jack London’s portrayals of Man vs. Nature in “The Call of the Wild”, we see some kinship with the elemental nature of what it takes for a human to survive when others would give up hope. There has to be something within a man that furthers the struggle, an inward spark that is seen faintly. One of the unquestionable stars of the show is the cinematography, where Nature’s unyielding essence is on display throughout most of the movie. This is a long, and slightly drawn-out story of survival and revenge. 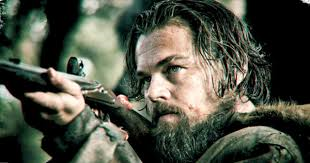 But although we’ve seen it done before, in Jeremiah Johnson and in some respects, in Apocalypse Now, this is DiCaprio’s signature role and perhaps, the one that brings him a well-deserved Oscar for an impressive career full of stellar performances.